Bang might be one of the best bands you've never heard. These guys really seemed to just miss becoming household names with the big bands of the era by a small margin over and over again. 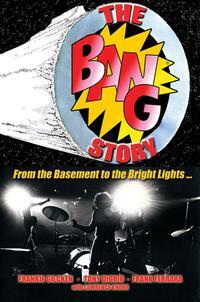 This new book chronicles the story of the band. On the one hand, it's a fairly easy read because it's a short book. It's about 190 pages, but only about a hundred of those are actually the story. That makes this a book you can get through in a short period of time. On the other end of the spectrum, despite the brevity of the book, it doesn't read all that well. It seems a bit awkwardly written and includes more grammatical errors than you usually expect. The wording is often clunky, and it seems that there are quite a few pointless passages built into it. I think a lot of the problems might come from too many cooks. Three of the authors listed here are the band members. I would imagine that Lawrence Knorr compiled all the interviews and created the book from that. As someone who has built a book around a number of interviews, I can tell you that the puzzle pieces don't always fit exactly right. Still, more attention to editing and proof-reading would have gone a long way toward helping. Even the author names are odd on the book cover. I've listed them in the order in which they appear on the spine. On the front cover Knorr is listed on the bottom preceded by "with," and the other names aren't in the same order as they are on the spine. All of that said, though, this is still worth checking out. Bang made some great music, and their story is intriguing. I mentioned that the text itself is only about 100 pages. The rest is taken up with lots of photos, lyrics to Bang's songs, discography information and more.